“It’s easier to maintain than to fix.” That is the law off the land. Maintenance is where we get most excited. If your car is getting detailed, you should expect it to look perfect once it is complete. That much is true. But what about 6 months later? Or years later? The vast majority of the detailing industry does not think past that first detail. In fact, it is in their best interest that you do not properly maintain your vehicle because you’ll have to keep going back for restoration work! Remember the issues with wax? Our goal is simple: make your car look good, make it look good for a long time, and make it very easy to look good again later on. This is the beauty of Ceramic Pro. Not only will your car look amazing the day it leaves our shop, but it will look just as good after a 30 minute wash 9 months later. Our goal is to position you to not need a true, “restoration detail” again. Our goal is after your car leaves our garage for the first time, it only needs to be washed; no more detailing. If it is not easy to wash your car, you won’t do it. If it is not easy to go through a touch less wash, you will not do it. We solve these problems by offering multiple, very easy, ultra convenient maintenance options. Our solutions for a clean car are so simple, it’s harder to not do it! The Ceramic Pro Bronze Package is an excellent value! Ceramic Pro is a highly hydrophobic, nano-ceramic paint coating. It protects your vehicle and keeps it looking glossy and new. Washing your car is a breeze, as dirt and grime easily slide off the slick finish. The Bronze Packages includes a two-year warranty and consists of one layer of Ceramic Pro Light on the vehicle, one layer of Ceramic Pro Light on the rims and plastic surfaces and one layer of Ceramic Pro Rain on front side windows and the windshield. You can come to us for a quick wash. On a Ceramic Pro car, it will only take 30 minutes, start to finish. Our prices are as low as we possibly can make them for a non-machine wash : $15-$65 depending on frequency and the size of your vehicle. Generally, we encourage our clients to receive a hand wash 2-4 times a year for strict maintenance purposes. Some like it more though and come bi-weekly! As we grow, we will have more locations throughout the Twin Cities to make this service offerings ultra convenient! It can’t possibly be more convenient then having us come wherever you want whenever you want to get your car cleaned. Our mobile service includes a standard hand wash or waterless wash, interior vacuum & touchup, and a coat of Ceramic Pro Sport! We are fully self-contained in our mobile service unit and do not require any assistance from you. Our goal with our mobile service is to completely reset your vehicle to day 1. Like to wash your car yourself? Let us teach you how! We sell all of the equipment you need. It’s the same equipment we use ourselves. 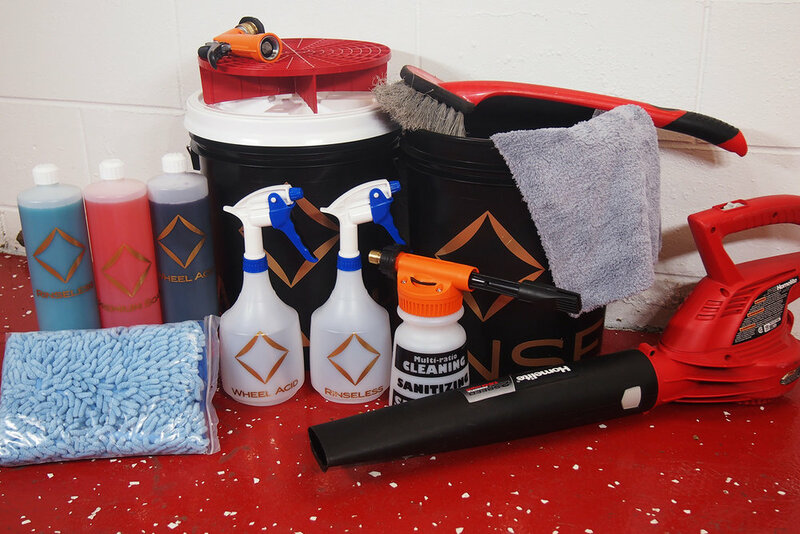 Whether you want traditional two bucket wash or modern waterless washes, wet provide you with step by step instructions, and even offer hands on training at our facility or mobile! DIY is also available for group events as well. With Ceramic Pro, touch less gas station washes are an excellent way to keep your car clean! Normally, one of the biggest issues with gas station washes are the acids used to make them touch free. But Ceramic Pro is resistant to chemicals, so no harm. In fact, Ceramic Pro make touch less washes work significantly better than normal. This works incredibly well for your daily driver, especially during the winter. When you put it all together, you should realize our philosophy on detailing is very systematic. We don’t want to keep detailing your car; we don’t want to do Step 1 again. We want to maintain it using the littlest amount of time possible, for the cheapest we can, using the smallest amount of resources as well. This is what Ceramic Pro allows for. This is our true objective. Overtime, our methods are cheaper and more sustainable than traditional detailing structures. The cost to not maintain your car is far greater than to maintain it. The first time we detail a car, it might take a week. While the restoration detail is a ton of fun and the “flashiest” part of our business, fundamentally it’s not what gets us most excited. For us, we are most excited when we see your car months and months later and it only takes 30 minutes to make perfect again.